Lost a little respect for coach Smith during the Fix, Suriano match. Really, you want to win by a hands to face, pulled headgear call? Which by the way didn't happen! You came across as a crying sore loser. Ok,rant over. He has a brick left to throw. Why not? He’s better off teaching Fix a go-to takedown than insisting on a hands to the face call. Fix never tried to score. He’s trying to help his wrestler win the match. If my opponent grabbed my headgear in OT to help him win, but my coach didn’t stand up for me because he “didn’t want me to win that way” I’d seriously consider transferring. You’re talking about the guy who as a coach perfected the lung time out, dive out of bounds and drop to the legs ride. Not too proud to win any way he can. John Smith is a sore loser like everyone in the sport. He argues with the ref like every coach in the sport. Even when it's ridiculously slanted to his guy. He's not even the most winning coach to ask for a last second head gear grab to waive off a winning TD to determine a title. But with all of that I think he'll just have to move on and attempt to live without your respect. ask zahid and hall how they feel about pulled headgear calls. made a big difference in their resumes. His real mistake was to use his last brick on a hands-to-face. Save it for when a TD or back points are at stake! It's his job to fight for his wrestlers on the mat. Can't hold it against him. I think smith has every right to question the headgear issue. Soriano clearly put a solid hand on it fending off Fix, the question was did he try to pull it or use it to gain any type of advantage. Ref said no. Not the way you want to win a match but if it was a pull no one wants to loss a match that way on a no call. I'm actually b o'connell but they were the same if we go back far enough. Either way congrats on both Rutgers titles. Very cool and it opens some recruiting doors that could make Rutgers a real team contender. Why would you lose respect for a coach asking for a reasonable review? That easily could have gone the other way. Throwing the brick there was the right thing to do. Also, who cares if somebody wins off a penalty point? If an opponent breaks the rules then they get hit for it. There's nothing wrong with wanting a review to see if he got the TD off of a headgear grab. Pretty much this. I'm not sure what @garyc was getting at with this thread. What was Smith supposed to do there? But (apparently) that's not grabbing the head gear? However, Fix should have been dinged a couple of times/points for stalling. 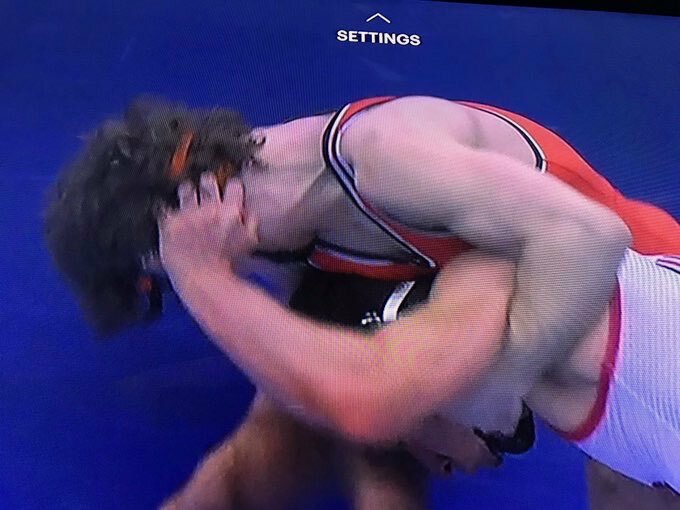 I'm not sure what match the refs were watching, but they missed a lot in this one. What the hell are we still wearing headgear for anyway? It would be pretty funny if Smith was held to the same standard as Brands. When was OSU’s last champ that wasn’t his relative? World team member? Actually, he'd have been better off telling Fix to get a damn haircut. If Suriano did actually grab the gear, who could tell with that scrub brush on his head? I had the same issue last year with Rasheed, his PIA dreadlocks and the stupid doo-rag he tried to wear. Touché. But hanging your hat on Dean Heil is sort of an indictment of the program in and of itself. Every program would like to be "indicted" by a wrestler like Dean Heil. 2X National Champion, lest you forget. Was so "dominant" with his boring style that the rules were actually changed. Actually, no they wouldn’t. The rules were changed because he games the system so bad it made everything boring. That’s not an accomplishment. Folkstyle wrestling is better off because of how awful Heil’s style was and it made them change so he will always have that. And the national titles. But that too. Oh? If his style was so without merit, why wasn't everybody else copying him and winning cheap/easy titles? Have you ever complained about Tony Nelson's eye-glazingly dull style of wrestling before? Heil was hardly the first "dull" wrestler to come along and win. Ever watch Leroy Kemp wrestle?? The fact of the matter is this: if a guy doesn't go outside the rules, there is no "gaming the system". Tony Nelson was boring as hell too.